Your complete ceremonial minister credentials package for New Hampshire includes all of the documents you'll need to legally perform all of life's celebrations, including weddings, baby blessings (baptism), house blessings, re-commitment ceremonies (vow renewal), memorials (funerals), handfasting and other ceremonies. Ordination through First Nation as a Wedding Officiant and ceremonial minister complies with all New Hampshire laws and is valid and accepted throughout the state and everywhere around the world! The laws of the State of New Hampshire require non-resident ministers* to file their credentials with the Secretary of State's office in Concord prior to performing a ceremony anywhere in the state. You must hold a current and valid minister's license to perform such rites; in addition, you must present your credentials to any state or local authority and/or the bridal couple upon their request. In New Hampshire, ordination or investment by the Church gives each clergy member the authority to perform the marriage rite. You are not required to undergo any specific formal training to become ordained in New Hampshire. Not a resident of New Hampshire? 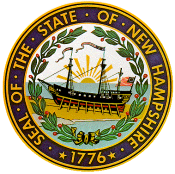 Legally ordained non-resident ministers are allowed to serve in New Hampshire, but must register with the Secretary of State's office in Concord prior to performing a ceremony. All required forms are included with your ordination. Additionally, if you request complete ordination, you will also be permitted to serve in your home state. Registration Fee: The current registration fee is $32 for comprehensive (complete) ordination that is accepted in New Hampshire, as well as most other states and local jurisdictions (two-year licensing term). All state-required forms and documents are included. * — Ceremonial ministers permanently residing in New Hampshire are exempt from this requirement. Please select your preferred ordination package. All ordination levels permit you to perform marriage ceremonies anywhere in New Hampshire. Each ordination level complies with all state and local laws and is accepted throughout New Hampshire for resident and non-resident Marriage Officiants. Prices shown in US dollars (US$). Includes personalized ordination certificate, New Hampshire marriage law guide and all forms and documents required to perform one marriage ceremony anywhere in New Hampshire. Includes personalized ordination certificate, letter of good standing, minister credential ID card, New Hampshire marriage law guide and all required forms and documents. Complete ordination permits you to perform an unlimited number of ceremonies in New Hampshire and most U.S. and international locations without restriction during your ordination term. YES. I am a current resident of New Hampshire. NO. I am NOT a current resident of New Hampshire. Non-resident ministers must register in New Hampshire prior to performing a ceremony anywhere in the state. All necessary forms and documents are included with your ordination. Not a resident of New Hampshire? Not a problem! Upon registering, you are permitted to perform ceremonies in New Hampshire without restriction.